Lent by the Alderman Library, University of Virginia. 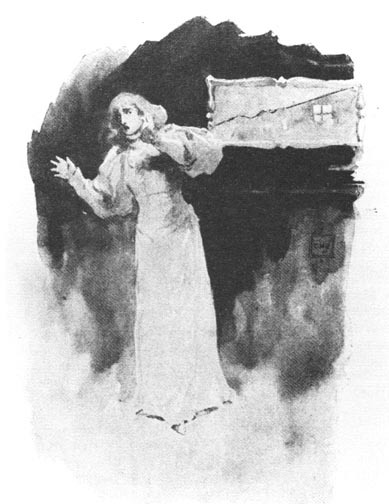 Charles Howard Johnson's sparse style of illustration graces the pages of a late nineteenth-century American edition of Tennyson's poetry. Johnson's vignette depicts that moment when the Lady's "mirror crack'd from side to side." Johnson, an American illustrator about whom little is known, includes only the two essential narrative elements, the Lady and the mirror, both of which he represents with little decorative detail. Hence, his image contrasts greatly with that of Hunt's famous Moxon engraving of this subject. Neuringer, Miriam. Ladies of Shalott: A Victorian Masterpiece and its Contexts, Ed. George P. Landow. Brown University: 1985. p. 126. Tennyson, Alfred Lord. The Complete Works. 2 vols. New York: New York: Frederick A. Stokes Co., 1891.